I love checking the mailbox when I get home from work. After confirming no spiders have made their homes near the mailbox handle, I find such a delight in discovering a hand-addressed envelope amid the stack of bills and junk. Isn’t that the best?! And is it just me or has the U.S. Postal Service really upped their game in the stamp department? Harry Potter stamps…are you kidding me?! You know I’m already stocked up to the max. I hope they sell those bad boys FOREVER. 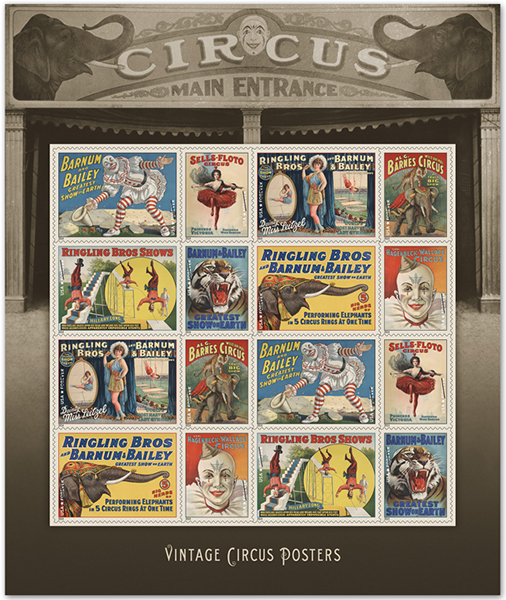 And I just came across these beauties and wish they would’ve been around for BFOTBM’s vintage circus baby shower a few years ago. I would’ve ordered this set or Johnny Cash ones for Mumbles’s birthday invitations and these would make a clever little stocking stuffer for someone like my dad who doesn’t know how to use email. And, really, who couldn’t use some stamps to keep in their wallet or desk drawer? If you need a gift for someone, how about stopping by the local post office to see if they’ve got any good ones and you can slip a pack of stamps in with a pack of pretty stationery, a nice pen (this one is my favorite) and even a custom return address stamp and ink pad. Wouldn’t that make such a thoughtful gift?! I’d love it, that’s for sure.